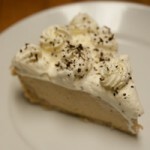 My mother-in-law makes a wonderful Irish Cream Pie. 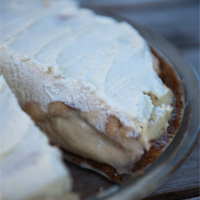 The more I thought about this pie, I thought about the Beer Cocktail of Guinness Irish Stout, Jameson Irish Whiskey and Bailey’s Irish Cream, otherwise known as a Car Bomb cocktail. So, I decided to run with the concept and take the classic beer cocktail and re-create it into Irish Car Bomb Pie. 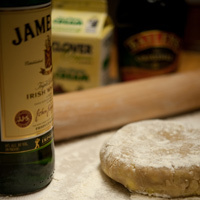 I use Irish Whiskey in the pie crust, reducing the amount of water, increasing its easy of rolling out while still making a delicious and flaky crust. 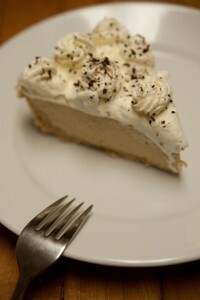 Then I combine Irish Stout and Irish Whiskey into a mousse filling and top the beer pie with a Irish Cream topping. 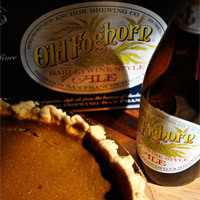 With one bite, all the flavors of this beer pie, combine in your mouth, re-creating this beer cocktail. 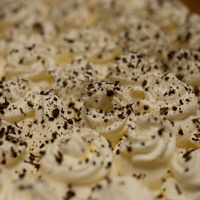 To make this Irish Car Bomb Pie more flavorful and unique, try making your own Homemade Irish Cream Liqueur. 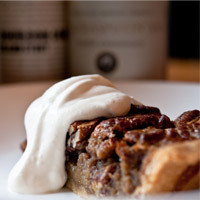 It adds more richness, more complexity and more umami dairy elements. Taking a Car Bomb cocktail (Bailey's Irish Cream, Guinness Irish Stout and Jameson Irish Whisky) and turning it into a Irish Car Bomb Pie! 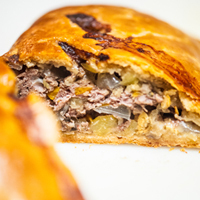 Note: Adding whiskey to the pie crust recipe results in less water being added in the dough (percentage of alcohol to water), making a forgiving pastry that is flaky and packs an extra punch of flavor for the filling to stand up to. In the bowl of a food processor, add the two flours, DME (or sugar) and salt. Pulse several times to mix the ingredients together. Add the cold butter and shortening to the bowl and pulse a few times to cut the fat into the flour. Keep pulsing until the mixture has small grain-sized chunks of fat evenly distributed throughout. Transfer the mixture to a medium-sized bowl. Add the whiskey and ice water. Using a spatula, fold the liquid into the flour/fat, until the mixture forms a ball. Since the alcohol mixed with flour cannot form gluten like water and flour can, over-mixing isn’t as much of an issue with this crust. 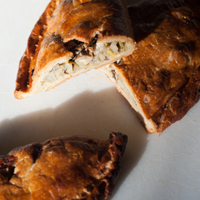 Plus, the alcohol will evaporate (40-percent alcohol), resulting in a super flaky crust. Form the dough into two equal-sized balls. Take plastic wrap and wrap each ball of dough, pressing down on each to create a disk. Place these disks into the refrigerator for at least 30 minutes to re-chill the fat, preventing the crust from shrinking as it cooks. Preheat the oven to 400°F | 204°C. Take one dough ball and roll it out to 1/4 of an inch-thick round, on a lightly floured surface. If you don’t have a rolling pin, use a chilled 22-ounce beer bottle that is full of cold beer. Roll the finished disk onto the rolling pin. Unroll it in a 9-inch pie plate or tin. Fix any cracks with any extra dough. 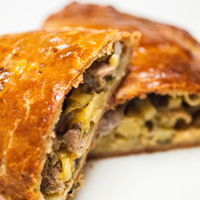 Crimp the edges of the crust and lightly poke the bottom with a fork (to prevent steam pockets), then place into the center of the oven and bake for 12 – 15 minutes or until golden brown. Let cool completely before adding filling. This recipe only requires one dough ball. 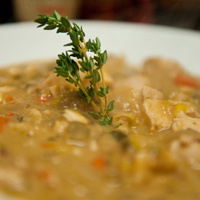 The remaining Irish Whiskey Pie Crust can be frozen or saved for another use, e.i., creating a Chicken and Leek Stew Pot Pies. In a medium-sized saucepan, add the gelatin, sugar, DME (or equal amount sugar), salt and mix to combine. Place the pan over low heat and add 1/2 cup of the cream and Irish Stout. Stir until the gelatin has dissolved. In a medium bowl, whisk the egg yolks until pale and fluffy. Add 1 tablespoon of the cream mixture and whisk into the yolks. 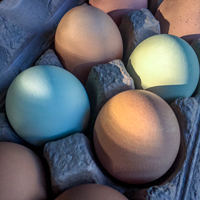 Repeat this step several times to temper the yolks, preventing them from scrambling. Add the tempered yolks to the cream mixture. Continue to stir, until the mixture thickens (reaching about 180°F | 82°C). Remove from the heat and place the pan in a bowl of ice water to chill down to 90°F | 32°C, just before the gelatin sets. Add the Irish whiskey to the mixture; stir well. In another bowl, beat the egg whites until they reach a soft peak. In a third bowl, beat 1 cup of cream until a soft whipping cream is reached. Fold the Stout mixture into the beaten egg whites, loosening up the filling. Add the whipping cream and fold into the Stout mixture, making a Irish Stout Whiskey mousse. Pour the mousse filling into the baked pie shell and cover with plastic wrap (preventing a film from forming) and chill in the refrigerator for at least 2 hours. Whip the remaining 1 1/2 cups of cream with recipe Homemade Irish Cream Liqueur and powdered sugar into a soft peak. Remove the pie from the refrigerator and take off the plastic wrap. Decorate the top of the Irish Stout Whiskey mousse with the whipping cream using a pipping bag fitted with a star tip, then garnishing with chocolate malt dust. Cut into 8 or 10 pieces and serve. 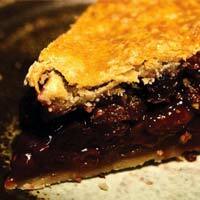 If the pie is not fully consumed, store the leftovers in the refrigerator. Looking for recipes that will compliment this recipe? 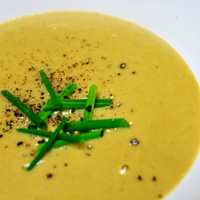 Check out my Irish Menu Ideas for other Irish Beer Cuisine recipes.